Offering more diversion programs and youth leadership development opportunities. 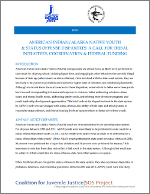 CJJ and the Tribal Law and Policy Institute have co-written a brief entitled, “American Indian/Alaska Native Youth & Status Offense Disparities: A Call For Tribal Initiatives, Coordination & Federal Funding.” The brief examines the disparities faced in the state system by AI/AN youth who are charged with status offenses, the ability of both state and tribal systems to respond to status offenses, and federal funding levels to support efforts to better serve these youth. The brief was released as part of the Safety, Opportunity and Success (SOS) Project, as a follow up the CJJ’s National Standards for the Care of Youth Charged with Status Offenses. If you’d like to learn more about the SOS Project, please visit the CJJ website or contact Lisa Pilnik at pilnik@juvjustice.org.